This tune sounds like a funeral march through bombay in blistering heat, led by a mad clown on a squeeze box with a chains on his ankles. Joined along the way by some mexican pan pipers before ending up in a Bollywood movie. 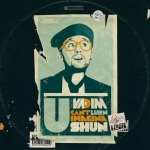 DJ Vadim's album 'U Can't Lurn Imaginashun' has been out for a while now, a melting pot of hip hop beats, soulful vocals, sharp raps, reggae knowhow, wonky samples and skanking party grooves. Top draw! Vadim is a prolific DJ and producer, born in Leningrad, USSR (now Saint Petersburg, Russia), raised in London and currently residing in both New York and Port-au-Prince, Haiti whose music combines hip hop, soul, reggae and electronica.